Barry Mannette is the son of the late steelpan tuner and leader, Vernon 'Birdie' Mannette. He started his steelpan career at the age of 11 years and has performed with many of the top steelbands in Trinidad and Tobago, such as Invaders, Hummingbirds Pan Groove, Phase 11 Pan Groove, Renegades, Valley Harps, Desperadoes, UWI Festival Steel Ensemble and Starlift Steel Orchestra. He started to develop his love for arranging at the age of 19 years when he started to arrange for Starlift. Since then he has consistently been arranging for Starlift and in 2005 he formed the Starlift Junior Steel Orchestra of which he is the Music Director. He has been on several tours to promote steelpan and perform at an international level. In June 2010 he led the Starlift Junior Steel Orchestra to victory with his arrangements at the Montreal International Steelpan Festival. The band won the Junior Panorama Competition and placed 2nd in the Adult Panorama Competition. In 2007 he arranged 2 pieces for Starlift's CD, Dance again Mr Bojangles and went on to take Starlift Junior Steel Orchestra to 4th place at the junior panorama competition in 2008 and 2009. His arrangements have been scored and placed on the latest Pan in Education CD. He attained his Certificate in Music from the University of the West Indies in 2007 and his B.A. Musical Arts from the same university in 2010 and is currently pursuing a Masters in Music Performance at Northern Illinois University. He is also one of the Music Instructors with the Northern Region of the National Youth Steel Orchestra since 2008. Additionally he has been working closely with the Music Literacy Trust of Trinidad and Tobago for the past 2 years as a music teacher/steelpan instructor. This former radio show host of the Pan Program, Original Magic of Pan, also placed 2nd in the Steelpan Soloist Open Category of the Trinidad and Tobago Music Festival in 2008 and 3rd in the Soloist Category of the National Steelband Music Festival in the same year. 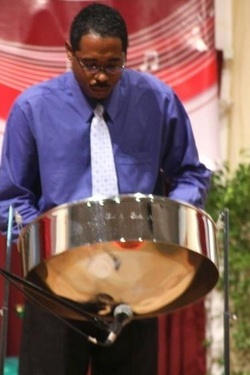 Additionally Barry has been a successful steelpan administrator; besides being the manager and captain of Starlift Steel Orchestra, he has also successfully managed the St Joseph's Convent Steel Orchestra. Barry continues to arrange with Starlift Junior Steel Orchestra.